Deluxe, aka Bob's Deluxe is a handsome 2½-year-old brindle male born July 2, 2008. His sire is WB's Shock N Awe, and his dam is Bob's Dateline. 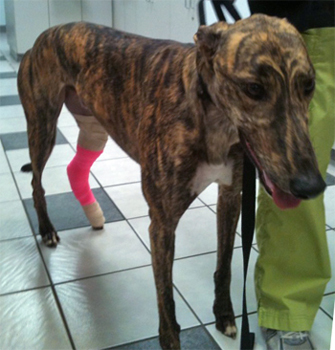 Deluxe suffered a debilitating injury in his second race at Gulf Greyhound Park in La Marque, TX., on November 24, 2010. He was transferred to Dallas on Tuesday, November 30. 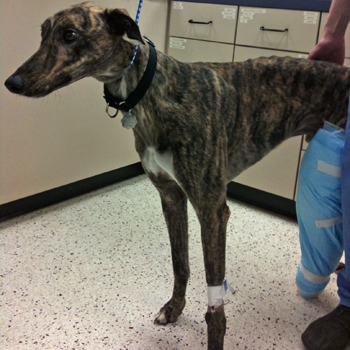 Dr. Bob Radasch of the Dallas Veterinary Surgical Center preformed surgery in the form of an arthrodesis on Deluxe's right rear hock on Tuesday, December 7. A 3.5x68mm screw was placed in lag fashion through the calcaneous into the 4th tarsal bone along with a figure 8 wire for stability. 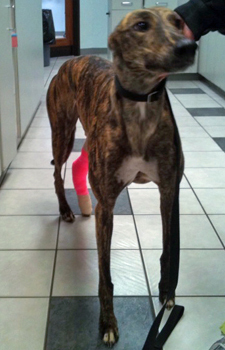 Deluxe's surgery and 8 weeks of bandage changes went well, and Dr. Radasch is pleased with the outcome. The screw and/or wire may need to be removed at some point in the future if irritation occurs, however this is rare. Deluxe is cat trainable, and has yet to be tested with small animals. Super Deluxe, as he is affectionately known in our house, is one of the easiest fosters we've ever had. Not much upsets this sweet boy--he's as cool as a cucumber and as laid-back as a La-Z-Boy recliner. He's got perfect housemanners, too, as he has yet to potty in the house and doesn't make much noise. He loves, loves, loves his food but is not a shark when it comes to treats. Deluxe sleeps all night in our bedroom on a dog bed and has free rein of the house when we're home. We do crate him without protest while we're gone, but I'm not sure it's necessary. He has rarely picked up something that wasn't "dog-approved", and a simple call of his name elicits him dropping the item from his mouth. He's very sensitive and seems to dislike upsetting the "management". Deluxe gets along well with our other large breed dogs, but they aren't his main goal--his "management" is. If you'd like a sweet, laid-back (not to mention STUNNING) boy to complete your home, Deluxe is for you!